Located on Baca Ln near the intersection of Veterans Memorial Hwy and Airport Rd, Extra Space Storage serves Santa Fe residents near Agua Fria and La Cienega. Locals will recognize our facility a few minutes west of Santa Fe Country Club near Shell and Rancho Carrera Apartments. Looking for storage units close to the airport? Extra Space Storage is about 1.7 miles from Santa Fe Municipal Airport, providing an easily accessible and affordable option for Santa Fe residents and visitors. 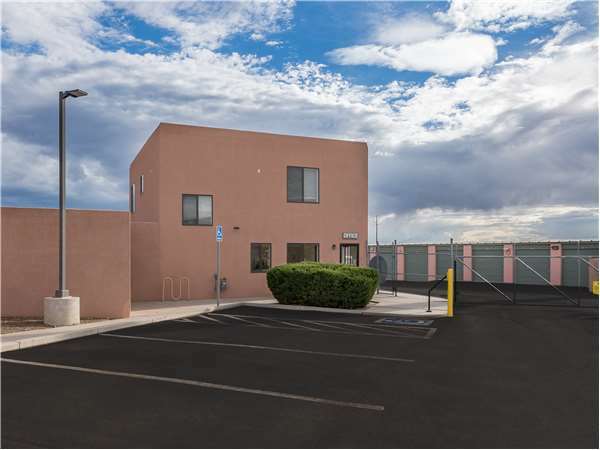 Extra Space Storage on Baca Ln can handle both residential or commercial storage needs in Santa Fe with a large selection of storage units, vehicle storage, and exceptional security! Our Santa Fe storage facility offers unit sizes from 25 square feet up to 300+ square feet with convenient features like drive-up access and outdoor vehicle storage. We have the space you're looking for! Jake at the Baca Lane storage facility is outstanding. Understanding & explains everything. You won't be disappointed with staff at Extra Storage, they are customer oriented and professional. The entire staff here is great! They have done special things to make me feel important. They have stayed late to wait for me, called me when someone that they didn't recognize was in my unit, and helped me many times when I was closing my unit. This place is top-notch! Intersection of Route 599 and Airport Rd next to Tractor Supply Co.
Take Route 599 South like you are headed towards the Santa Fe Municipal Airport. Turn left at the intersction of Airport Rd. You'll see Extra Space Storage at that intersection. To get to the office make your first left onto Oliver Dr. at the Tractor Supply Company. Then make your first left again, onto Baca Lane. The office will be on your left. Take Route 599 North like you are headed towards the Santa Fe Municipal Airport. Turn right at the intersction of Airport Rd. You'll see Extra Space Storage at that intersection. To get to the office make your first left onto Oliver Dr. at the Tractor Supply Company. Then make your first left again, onto Baca Lane. The office will be on your left. Take Airport Rd (rt 284) west like you are headed towards the Santa Fe Municipal Airport. Turn right onto Oliver Dr just past the Tractor Supply Company. If you've reached the intersection of Rout 599, you've just passed the turn and gone too far. Then make your first left onto Baca Lane. The office will be on your left. Take Paseo Real (rt 56) east like you are headed towards the Santa Fe Municipal Airport. Go past the turn for the airport and straight through the intersection at Route 599. Paseo REal becomes Airport Rd at that intersection. You'll see Extra Space Storage at the intersection. Turn right onto Oliver Dr just past the Tractor Supply Company. If you've reached the intersection of Rout 599, you've just passed the turn and gone too far. Then make your first left onto Baca Lane. The office will be on your left.